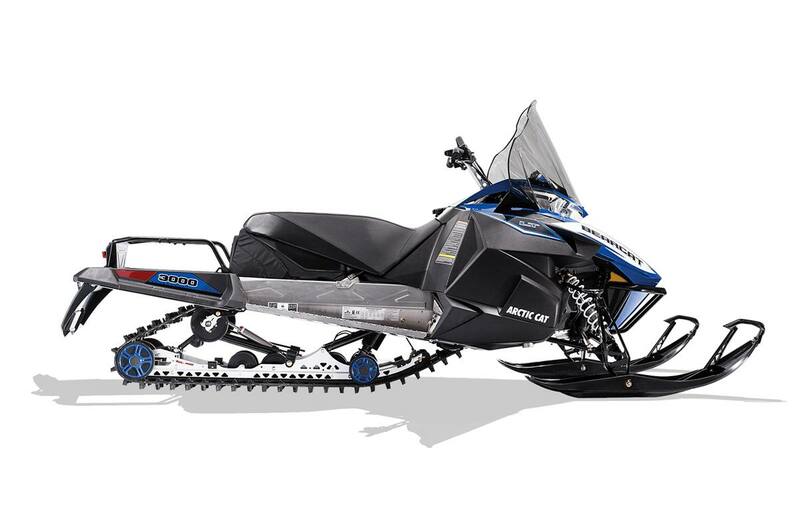 3000 4-Stroke Engine: New to the Arctic Cat snowmobile family is the Arctic Cat built 700cc 4-Stroke EFI engine; an engine that combines sufficient power with clean technology and incredible fuel efficiency. This 65-class horsepower engine is compact, lightweight and, thanks to electronic fuel injection, throttle response is immediate. Work or play, this new 4-stroke is raising eyebrows across the snowbelt. 17" High-Height Windshield: The extra-high windshield tames the wind out in the great white open. The mirrors make backing up easy. 146-in. Cobra Track with 1.35-in. Lugs: The 146-in. Cobra™ track’s cupped-lug design delivers superior handling, acceleration and braking in loose-snow conditions. Its “traction teeth” add extra grip on hard-packed surfaces. The 1.35-in. paddles provide extra traction when you venture off trail.